An X-ray lit up with more than a hundred white speckles – shotgun pellets that had burrowed into him. But one in particular worried the medical team. Thanks to the care team at UCHealth University of Colorado Hospital, Tom Essig went from 20/20 stereo vision to 20/200 vision in just one eye. That may not sound like a feel-good story. When you consider the alternatives, it is. 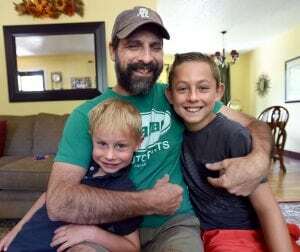 Tom Essig and his two boys, Colton, left, and Wyatt.Tom Essig was shot in the face during a hunting accident in Nebraska. He is now blind and his family is coping with the tragedy. Photo by Cliff Grassmick; courtesy Amy Essig. Essig, 48, of Longmont, was a husband and father of two boys. He worked long hours doing estimates for a hardwood flooring company and, among other outdoor places, liked spending his free time in the woods. He and a friend had for years spent a week at a 6,000-acre ranch near Callaway, Nebraska, rising before dawn and, in full camouflage, waiting quietly for wild turkeys to descend from their roosts in the canopy and avail themselves to the hunt. April 21, 2017 was day six of such a trip. They heard the birds, but hadn’t had much luck in getting off a shot. At about 7 a.m., they decided to move, the friend walking up one of the many hills in that part of central Nebraska, Essig circling its base. Completing the loop, Essig was headed up the hill when he heard a shotgun blast. Great, he thought for a split second – his friend had maybe gotten a turkey. Then it felt like his face was melting, so extreme was the pain. And he was blinded. The rest of that day Tom Essig would learn about from others. His friend had accidentally shot him from about 40 yards away with a 12-gauge shotgun that had a choke on the end – an extension that focused the hundreds of BBs in a magnum shell so as to boost the number likely to impact a turkey’s head. Except now it was Essig’s head, and they were two miles from the truck, which was more than an hour’s drive from the nearest hospital in Kearney, Nebraska. A cell phone call, some quick thinking by first responders, the assessment of the doctor at the small clinic in Callaway, and a helicopter got him to Kearney, where doctors stabilized him. BBs had pocked and penetrated everything from his upper chest to his scalp. The eyes were a big concern. The providers in Kearney arranged for a flight to the Anschutz Medical Campus, where they felt the UCHealth Eye Center (recently renamed as the Sue Anschutz-Rodgers Eye Center) stood the best chance of helping Essig. Essig’s wife Amy had been at work when the phone rang. The doctor at the clinic in Callaway introduced himself and asked if she was sitting down. Her husband had taken a shotgun blast to the head and was being flown to Kearney. Essig had had the wherewithal to share Amy’s name and cell number, at least. She and her father were soon headed to Nebraska, only to U-turn back toward Aurora when they got word that Essig was being airlifted to UCH. Amy was already there when Essig arrived in the evening. Someone handed her a bag containing her husband’s boots. She walked into the room to find his head and eyes wrapped, his face bloody and swollen, his body still in hunting camo. He looked rough and sounded rough when he spoke a few words to her. But he was alive. An X-ray lit up with more than a hundred white speckles – shotgun pellets that had burrowed into him. One in particular worried the medical team. Essig was wheeled to an operating room, where surgeon Dr. Erik Peltz found that BB of concern had lodged in the wall of his left carotid artery. Had it gone just a bit further, Essig would have never made it out of the woods. Peltz investigated the length of the artery after removing the pellet. The J-shaped incision ran from ear to nape. The mortal risk averted, an eye-surgery team led by neuro-ophthalmologist Dr. Prem Subramanian explored the wounds in both eyes, removed a BB from the tissue surrounding the left eye, and closed a corneal laceration in the left cornea. He also noted a hemorrhagic retinal detachment in the right eye, which would be the focus of a follow-on procedure. Amy stayed in the hospital with her husband for six nights. When her husband woke up, a breathing tube made it so he couldn’t talk. The first thing he wrote on the small whiteboard: “HOT!! !,” which triggered the removal of bedding layers. The second thing he wrote was “Am I dying?” Amy told him that no, he wasn’t. “That’s when I knew he was alright,” Amy said. 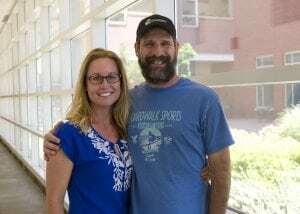 On May 1, at which point Tom had been back home in Longmont for only a couple of days, the Essigs were back at the Eye Center, where Siringo reattached the retina. While Tom Essig had been, generally speaking, far from lucky in the woods of Nebraska, had the pellet that pierced his right retina been a couple of millimeters away, the damage would have been far worse, Siringo saw. The exceedingly delicate procedure involved removing blood from underneath the retina and reattaching it. A later surgery, in September 2017, removed the scar tissue that can, left unchecked, detach the retina again. A third surgery, that December, removed the silicone oil used to help ensure the retina heals correctly after surgery, and replaced the lens of Essig’s eye, which had developed a cataract from the trauma. Siringo led the retina procedures and Dr. Derek Delmonte performed the cataract surgery. The eye responded. Before the first surgery, Essig had “hand-motion” vision, as Siringo called it: meaning he could detect movement and not much else. The surgeries had improved it to 20/200, though with a blind spot that occupied the center of his field of vision — such that, if he were looking straight at you from across a small table, he would see the top of your head and your collar, but not your face. An outside second opinion, which Siringo encouraged, confirmed that the UCHealth team had done great work, and that Essig’s eye was, as Essig put it, “as good as it was going to get.” But that didn’t mean UCHealth could do no more for him. Lewerenz tested various dimensions of Essig’s vision, including standard visual sharpness, contrast sensitivity, and his ability to read continuous text (as opposed to just eye-chart letters). Essig’s vision loss, being similar to that of patients with advanced macular degeneration, Lewerenz evaluated the nature of the blind spot to determine the quality of the vision around the different areas of the periphery. Doing that, he says, helps establish what parts of the visual field might best be augmented with glasses or other technologies. Essig met with the Low Vision Rehabilitation team three times. The prescribed glasses that help sharpen peripheral vision to the point the he can read by holding the text close to the eye as well as glasses for distance vision. He also got a handheld spotting telescope so he could watch his boys Wyatt, 10, and Colton, 7, on the baseball field. Occupational therapists (in Longmont, to save the long drive) worked with him on balance and aspects of day-to-day living. Lewerenz referred him to the Colorado Division of Vocational Rehabilitation for retraining. He and Amy also invested in eSight glasses. It’s been more than a year since the hunting accident. Essig has spent most of it around the house. For a while, he was recovering. Lately, though, he’s harnessing the vision he has to help the boys get ready for school and baseball practice, to fold laundry and do dishes, among other household tasks. Where his vision stops, he can often go by feel, he says. He used to be a woodworker and is, he says, “trying to figure out how to do that again.” He started by building a guinea-pig cage. His boys have adapted. They look out for him when he can’t see well enough to do so himself. Case in point: a friend of Colton’s came over and plopped his backpack in the middle of the floor. Colton said the bag had to move – his dad might trip on it. “Even having a little bit of sight, believe me, is light years above being blind,” Essig said. Amy is grateful that he’s here at all. Todd Neff is a Colorado-based freelance journalist and author.